Johan Marjonid who is also fondly known as JohMar is one of the Malaysia’s most established and known fine artists. He is widely regarded as being one of the few realists naturalist artists of the country. Comparatively, Johan’s work is highly unique and original especially with the rising number of artists who are more receptive to the likes of Abstract Expressionism and realism, among others. It is not common that one would come across an artist who have stayed true to his calling who has been involved in a certain style of work for decades and Johan is just the type of person who has. If one wants to know what Johan is, one would only need to look at his paintings because they follow a consistent way of realism with which they mature from experience. It is in his exemplary skills in still life paintings that Johan has carved a name for himself. And in doing so, he has created his own signature of paintings, particularly in the subject matter involving forests, trees and vegetation. Hence, the colour of green and its related shades are often seen in Johan’s work. However, one cannot and should not take Johan’s work too literal as they are heavily engulfed in the metaphors that he wishes to express. He has been actively involved in painting rain forest subjects since the mid 1990s where he produced some of the most compelling artworks of this time. This was seen through his works that encompasses the likes of series like the Rimba Kanching, Twin Towers, Jeriau and many others. Johan comes from the southern state of Johor where he was born in Ayer Baloi in Kampung Jelutung in 1968. The village is in Pontian where he enjoyed his early education and would then go on to finish his degree in Fine Art at the University Teknologi MARA in Shah Alam. Since then, he has been actively involved in the promotion and development of Malaysian art where he has contributed in teaching the fine art at several public and private art schools of the Klang Valley. Before that, Johan received his high school education from the SMK Dato Penggawa Barat, Pontian, Johor where he completed his STPM while he studied at SMK Benut and SMK Ayer Baloi both in Pontian where he completed his SPM and SRP respectively. From 2000, he started to venture into his art on a full time basis where he would produce some of his more remarkable works in the areas of the rainforests. As an artist, Johan is a very hands-on professional. He does not paint from snapshots or memory. In fact, Johan has been actively involved in experiencing the real scenery where he has been involved in expeditions to many of the natural rainforests around the country. Apart from that, he has also conducted his own trips to places like Mt Brinchang in Cameron Highlands, Gunung Stong in Kelantan, known as one of his favourite places. 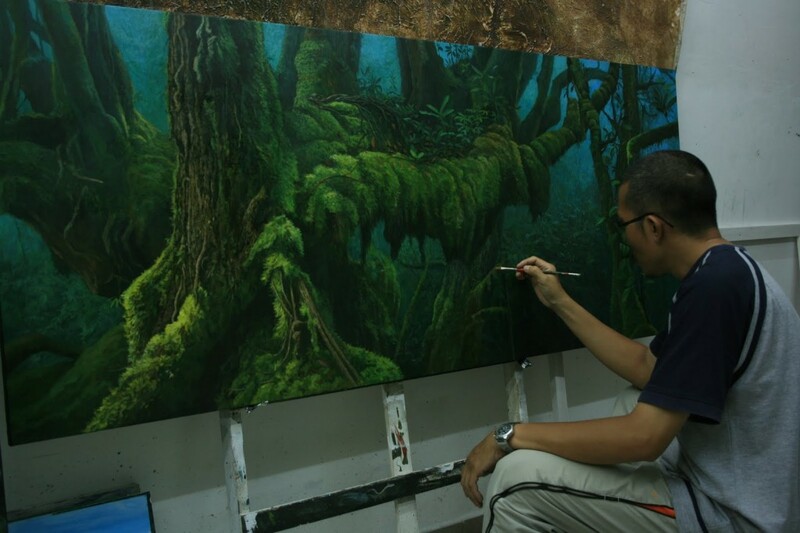 Apart from that, he also draws the sceneries and landscapes he sess from his trips to Endau-Rompin, the Royal Belum in Perak as well as from Pahang’s Taman Negara National Park and Gunung Tahan. To illustrate his more preferred locations, Johan is known to depict the same scenery in some of his paintings. However, a closer observation will find that the same spot has changed over the years because Johan would visit them almost on an annual basis. It is in the details of his paintings that make them stand out and exude his trademark. 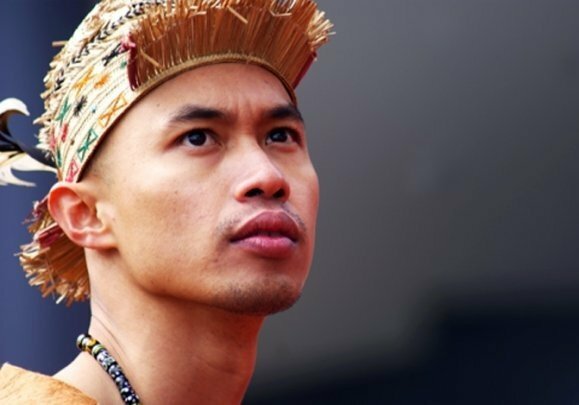 As one of the most established artists of Malaysia, Johan Marjonid’s work has been seen in countless exhibitions and shows around the country and abroad. Among some of his recent works were those showcased at the 2007’ “Biru Hijaunya BELUM II” show held at the Pelita Hati Gallery in Kuala Lumpur, the “Pameran Ulung” by R A Fine Art Gallery, the “Pameran Sentuhan dan Ilham” in Galeri Seni Johor, Johor Bahru and others. On top of that the ‘Biru Hijaunya BELUM’ was also shown a year before at the National Art Gallery while other shows he was involved in include the “Koleksi Terbaru” in 2005 and the “Melebu Alas” show at the Main Lobby of the Balai Berita in NSTP, Kuala Lumpur.